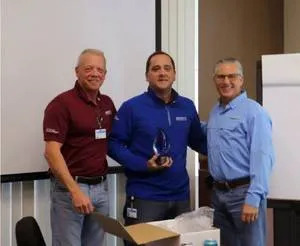 Victor Alonso is the 2018 Sonny’s CarWash College Instructor of the Year. Victor was presented with the Shawn R. Brown Award for Instructional Excellence by Paul Fazio, CEO of Sonny’s Enterprises LLC at a luncheon. 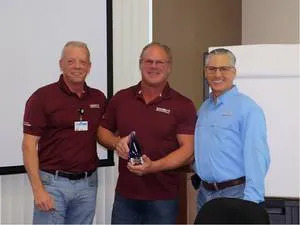 The Shawn R. Brown Award for Instructional Excellence is given each year in memory of Shawn Brown, a former Car Wash College instructor whose life was cut tragically short. Previous winners include Bryan Hage, Jorge Jaramillo, and Richard Ovalles. Left to right: Bob Fox, Victor Alonso, and Paul Fazio. Mark Barthelmass (center) with Bob Fox and Paul Fazio.